U.S. Special Envoy for Six-Party Talks Sydney Seiler, center, speaks to the media after his meeting with South Korean senior officials at the Foreign Ministry in Seoul, South Korea, July 27, 2015. The U.S. special envoy to the six-party talks is meeting this week with officials in South Korea, China and Japan to discuss restarting long stalled negotiations with North Korea to end its nuclear program. This is the first such high-level diplomatic visit to the region since the Iran nuclear agreement was announced. On Monday after meeting with officials in Seoul, Sydney Seiler, the U.S. special envoy for six-party talks said the U.S. is ready to engage Pyongyang in the same way it helped broker a deal with Iran to limit its nuclear capabilities in exchange for sanctions relief. “The recent progress in our efforts at denuclearization with Iran provides an excellent example of the U.S. flexibility and willingness to engage with countries with whom we’ve had long standing differences,” Seiler said. Some officials in the region have expressed hope that the Iran agreement could serve as a catalyst to restart international talks to end North Korea’s nuclear weapons program. In 2009 Pyongyang suspended these talks with Seoul, Washington, Tokyo, Beijing and Moscow. FILE - North Korean leader Kim Jong Un visits the Kumsusan Palace of the Sun to mark the 21st anniversary of the death of founder Kim Il Sung. Since Kim Jong Un assumed power in 2010,his regime has rejected overtures to engage in dialogue and has emphasized that the country’s nuclear weapons program is vital to the nation’s national security. Harsh international sanctions imposed against Pyongyang for conducting its third nuclear test in 2013 have not deterred North Korea from continuing to develop offensive weapon capabilities banned by the United Nations. Recently there have been reports the military has erected a launch tower in preparation for a long-range missile test possibly to mark the 70th anniversary of the North's ruling Workers' Party in October. Nam Sung-wook, a professor of North Korean studies at Korea University says Pyongyang is not likely to compromise on its status as a nuclear power. “Even if the international community imposes more sanctions against North Korea, it is unclear whether North Korea will join in talks and give up nuclear power,” he said. There is some speculation that recent high-level purges inside the Kim Jong Un regime may be causing instability, leaving the leadership too weak and exposed to challenge nuclear hardliners. Other analysts contend that Kim Jong Un has actually strengthened his grip on power by eliminating any possible threats to his authority. South Korea’s National Intelligence Service estimates that Kim Jong Un, since he came to power in 2011, has replaced 20 to 30 percent of senior party officials and more than 40 percent of senior military officers. North Korea’s improving economic conditions due to market reforms and increased border trade with China may have also made the country and leadership more stable and less susceptible to international pressure from sanctions. 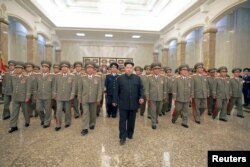 North Korea has posted positive economic growth for the last four years. Agricultural reforms and increased food aid are also expected to help alleviate the effects of a severe drought in the North this year. North Korea’s allies China and Russia continue to support negotiations to persuade Pyongyang to give up its nuclear ambitions. U.S. officials have said China is growing increasingly alarmed over Kim Jong Un’s unwillingness to engage in talks and may support new punitive measures against Pyongyang. But North Korea analyst Ahn Chan-il, with the World North Korea Research Center, says Beijing has been reluctant to exert further pressure on Pyongyang out of concern that it might increase instability and the potential for conflict in the region. “China is pressing North Korea for denuclearization, but it has resumed supplying oil and partially approved visits for tourists,” Ahn Chan-il said. Washington for its part continues to demand Pyongyang take actions to halt its nuclear development before any new talks can begin. The historic nuclear deal reached with Iran will make North Korea the only U.N. member state under sanctions for pursuing a nuclear program.